A Matter of Memories: :SALE: 15% OFF All Vintage & Retro-Themed Products at Scrapbook.com...TODAY ONLY! 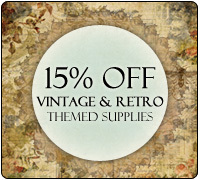 :SALE: 15% OFF All Vintage & Retro-Themed Products at Scrapbook.com...TODAY ONLY! Do you have a heritage album that you've been meaning to start (or finally get finished)? Or, do you just love retro or vintage-themed patterns? If so, today is your day to stock up as Scrapbook.com is hosting a sale. You will be able to get 15% off the lowest marked price on ALL Vintage and Retro-Themed* products, today only! No coupon code is required. The discount will appear automatically in your cart. Shop Vintage and Retro-Themed items for this great discount. Hurry - this offer expires at midnight PST! *All products where theme equals "vintage" and all products where theme equals "retro" are eligible once they are added to your shopping cart.